Born Saratoga Springs, NY, August 3, 1985; married; 5 children. B.A. in Public Communication, University of Wisconsin-Green Bay, 2006; Hazmat Tech certified, U.S. Army Chemical School, 2012. Gibson Town Board Supervisor; Operator and Emergency Response Team. Member: Disabled American Veterans; American Legion; Manitowoc Fish and Game; National Rifle Association. 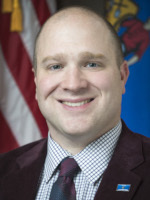 Former: U.S. Army Sergeant, U.S. Army Reserve Chemical Corps, 2009–2018; Green Bay City Council Member; Wisconsin Right to Life (county chair).